If you have ever owned a lemon, you know how frustrating it is to get the problem fixed or the car replaced. If you haven't, consider yourself lucky. 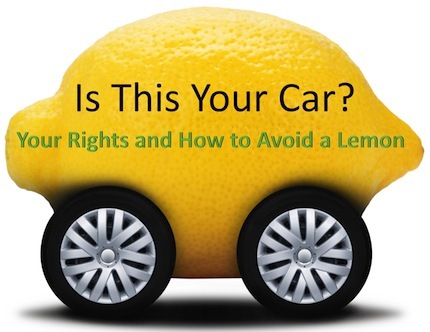 Here are tips on how to avoid buying a lemon in the first place and your rights if you do! Approximately 1 percent of all new cars sold each year are lemons. But estimates vary greatly and may be low, as manufacturers are not required to report lemons. Consumer Reports collects data on more than a million cars to publish its list of the 10 least reliable cars at 125 percent below that of the average vehicle – or worse. Laws vary by state, but people who think they own a lemon must file a claim within one to two years of delivery or before reaching a set number of miles. Check your state here. Howcast provides an overview of lemon laws and discusses how you can protect yourself if you think you may have purchased a lemon. View video. Comcast Newsmakers interviews an expert about consumer rights in lemon law cases, including key definitions, options and myths. View video. Consumer Reports takes a peek at the most reliable cars for 2015, noting particular improvement among American-made brands. View video. Test your smarts on lemon law with this short quiz and enter our drawing for an iPod Shuffle.